Detailed attention to compliance with labour and employment laws is crucial for success in setting up business in a foreign country. 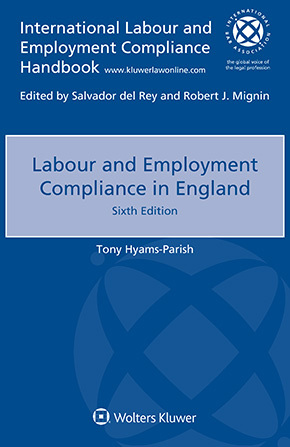 This book – one of a series derived from Kluwer’s matchless publication International Labour and Employment Compliance Handbook – focuses on the relevant laws and regulations in England. It is thoroughly practical in orientation. Employers and their counsel can be assured that it fulfils the need for accurate and detailed knowledge of laws in England on all aspects of employment, from recruiting to termination, working conditions, compensation and benefits to collective bargaining. A wealth of practical features such as checklists of do’s and don’ts, step-by-step compliance measures, applicable fines and penalties, and much more contribute to the book’s day-to-day usefulness. Easy to understand for lawyers and non-lawyers alike, this book is sure to be welcomed by business executives and human resources professionals, as well as by corporate counsel and business lawyers.